I've put out another pack of short stories for the Kindle and the Nook. The Shadow of Dream - Protecting your children can sometimes be a nightmare. Bryan and the Case of the Disappearing Playboys - A true story from my youth. The Cruel Kids - If you found out a kid you mistreated in your past killed someone, would it change you? Hungry - Sometimes you can still be a kid and have lived through horrible things in this story from World War II. The thing that unifies these stories together in a way I think makes sense for a collection is that they've all got an element of lost innocence to them. People don't often talk about the darkness in the lives of kids these days, and these all shine a light on that in some way or another. 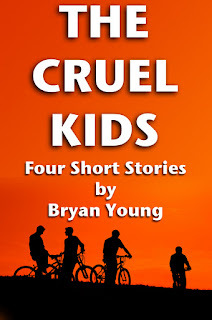 You can get The Cruel Kids for the Kindle or the Nook. I'll be checking this out for sure! You're stories are truly inspiring. I just started a blog called "the write way" where i write my own short stories and poems.